FRIDAY. I picked up this coat at Zara a couple of weeks ago and I’m so excited to FINALLY be able to wear it. Mad for plaid? Most definitely! COAT Zara (similar one here). SHIRT Zara (similar one here). JEANS J Brand. BAG Proenza Schouler (here). BOOTS old ones from Din Sko (similar ones here & here). 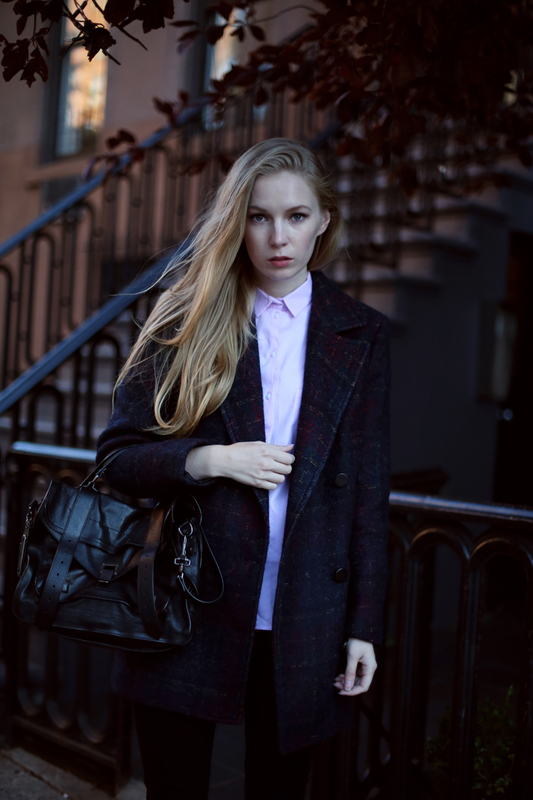 This entry was posted in Outfit and tagged coat, FALL, plaid, tartan by Carolina Engman. Bookmark the permalink. You look pretty in that coat! Nice combination btw! Love this outfit, looks so good on you and perfect for the cold weather! Nice coat! And you look great in it! Simple and beautiful outfit! Love the jacket! Love the coat!! And such a beautiful setting. Love NYC!!!! I love the touch of pink of the all-dark outfit! Very cute!! You look always great. I like that jacket. this coat is completely amazing ! Amazing photos, I really love the first coat! You look so pretty! LOVE this. Especially because the plaid is quite subtle… makes it super chic! 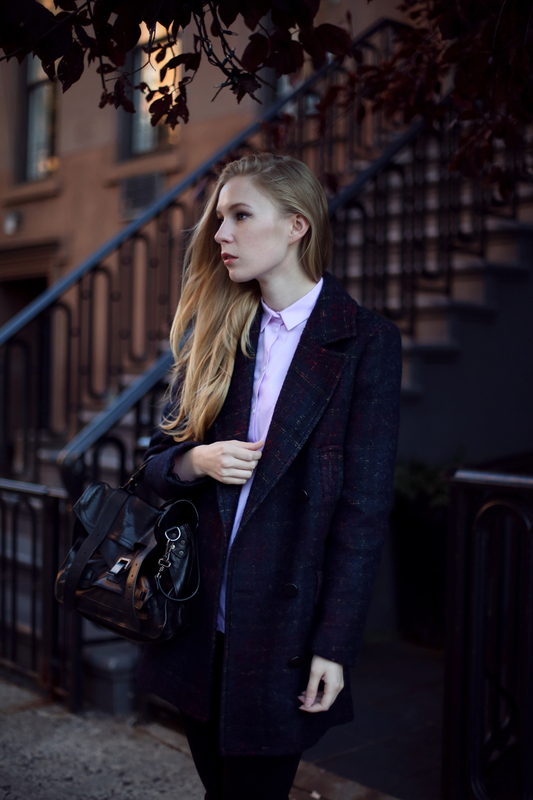 It is a great combination, I really like the way you’ve paired the coat and the shirt, preppy and stylish!! super stunning outfit! love these pictures! you’re so expressive! Lovely pictures, you look gorgeous! Love the plaid in the coat! It´s subtle but so very beautiful! love the coat! so so cool! I like your selection. It is beautiful. That coat is perfect! The subtle nature of the check is fab. I’m loving this men inspired look ! So casual and gives you a completely polished look. And that handbag btw, is GORGEOUS!! That is one insanely beautiful coat, I have seriously envy for it right now! Lovely photographs. I like your coat and bag. Love the subtle plaid blazer… very nice. Love the coat! Great silhouette and plaid. Lovely coat! I wasn’t sure I should buy it when I saw it at Zara. Amazing coat and cute outfit! gorgeous coat, you look amazing! This is the perfect coat!! Loveee! Great photos, love your outfit and that coat is amaizng! i love this look! effortlessly cool! This coat is amazing and I love the look! That coat looks fabulous on you! Certainly is gorgeous, love the cut and style! My bloglovin’ feed is exploding with plaid. And I am loving it! the coat is fabulous!♥ love it! Mad about plaid? Me too! :) Great look! Beautiful photos, love the coat! awesome choice! like dark plaid version! Love love love the coat and your boots. Love this outfit, the coat is gorgeous! Zara is definitely my number one destination for winter coats. I am in love with that coat. Awesome. Fell in love with the jacket. You can tell the price? I love your coat! Great outfit! CRAZY COAT, obsessed with it! The coat is really great!